One of my favorite illustration projects so far this semester was to create two montages of line drawings with minimal amounts of spot color. The lines were supposed to be different weights using pen or markers. I usually draw things in pencil first, so it was fun to go over my drawings with different thicknesses of markers. I’m also usually working on realistic drawings, so I liked being more spontaneous with this project. We had to include a person, a building, and an object in each illustration, and the series was supposed to be centered around a theme. My theme was the State Parks. I scanned my drawings, re-colored the lines digitally, added spots of color, and arranged them into a collage/montage. 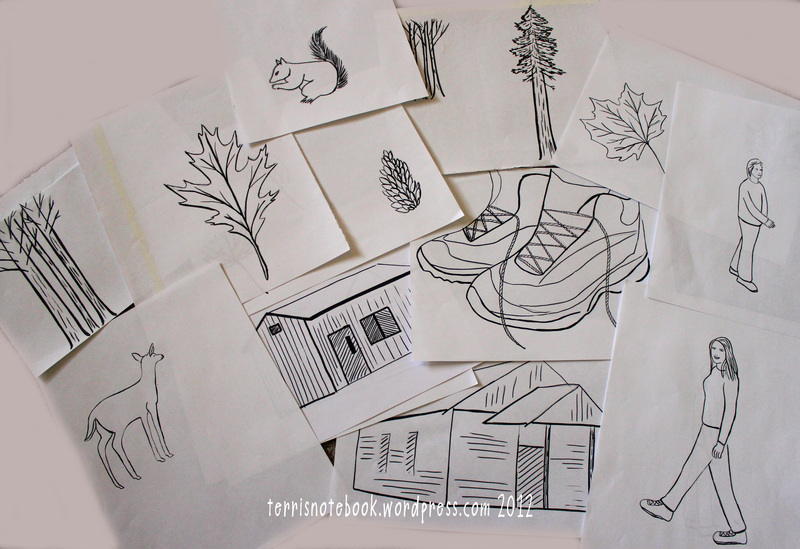 My concept was a t-shirt graphic for a trail restoration event or a poster at a visitor center, so here’s what these illustrations might look like on t-shirts. Pretty cool, in my opinion! I love the idea of using line drawings from sketchbook doodles, and changing the lines to a color other than black. This made me want to fill up a sketchbook with lots of line drawings centered around themes, so I’m adding this to my list of things to do in 2013. I love how they came out! They do look great on the t-shirts as well! Thanks so much Cheryl! I love doing line drawings in my sketchbook (and want to do this more), so this was a really fun project for me. Those are so real and colorful!! Those a pretty neat. I never would have thought to put them together like that. They are really effective. I like how you have some overlapping. Cool. Thanks Stephanie! Because these were montages/collages, we had to overlap the items. And we could only do off-register spots of color, which was hard to keep simple. How cool are those designs. I can see you making one of these tshirts for yourself with a design of you hiding in your tree. Oh yes, Bev, that is a fantastic idea to do one of that hollow tree! I love it, so thanks for the idea.